blinds and shutters. Here’s how to survive common holiday budget busters and stop the stress!” width=”420″ height=”629″ />With the holidays just around the corner, even the most budget conscious among us may start loosening our purse strings and indulging in every single invitation and outing even if it may leave us in a financial bind. The holidays tend to do that to most Americans every year. Last year, Americans were planning on spending more than $800 on Christmas gifts — and that doesn’t include all the extra spending that goes on for holiday cards, the Christmas tree, the fancy dinners out, and so on and so forth. It’s not entirely our fault, though. There’s something about that Christmas spirit that puts us in the giving mood. After all, nobody wants to be labeled a Grinch, right? But if you’re on a budget, the holidays could lead to disaster, so it’s important to keep your budget in check. Here are five holiday budget busters and how to keep them in check. First, you make your list. Then, you check it twice. Then, you start adding more and more, and before you know it, your gift list has more than doubled in size. We understand you want to give to everyone and let them know you appreciate them, but limit your gift giving to the absolute must-have people, like close friends and family. Do you really need to participate in the office white elephant gift? Haven’t you gotten enough mixed nuts to last a lifetime? Kindly defer in gift exchanges and blame it on your budget — chances are, most people will understand. Once you’ve narrowed down your list, decide on a budget for each recipient and force yourself to stick to it! A good way to limit your gift purchases is by using a prepaid card with your gift giving budget already loaded onto it. This way, there’s no way you can go overboard! Your children do not need the latest and greatest. Try to teach them the meaning of the season by perhaps choosing to share experiences rather than things like blinds and shutters, or volunteering together as a family. If you are interested in blinds, then check out these blackout blinds made to measure. Holiday parties are always fun to attend when it includes great friends and great food (booze can help too!). But they’re not as fun if you’re going to stress over your budget by attending. Hostess gift? White elephant gift? Ugly Christmas sweater purchase? All of these things add up quickly, making party attendance a sneaky budget buster. Force yourself to stick to your principles by declining the invitations you’re not really excited about, and accepting the one or two that you are actually looking forward to. Don’t feel like you have to go out and purchase a brand new ugly sweater, either. Check out your local Goodwill shop which are often overloaded with these holiday items. The holidays can be a stressful time. And when stress rears its ugly head, we tend to get complacent and lazy. As such, we may start to get take out much more often during these weeks because–what the heck, why not, right?! But complacency is a huge holiday budget buster, so it’s important that you set aside time to write out your meal plan and stick to it. Having ample food in the fridge and pantry will help your family from giving into the take-out monster. Sometimes all we want to do is put our head on the pillow and forget about the stress of the season. But delaying your gift buying will only put you in a time crunch later on, which can lead to buying things at full price. I can’t believe I’m saying this, but start shopping! Start shopping early, that is. Shopping early rather than waiting until the last minute will help you price match and make sure you’re getting the best deal. The holidays will definitely cause a budget pinch, but if you plan it smartly and avoid common pitfalls, you can enjoy the holidays, too. 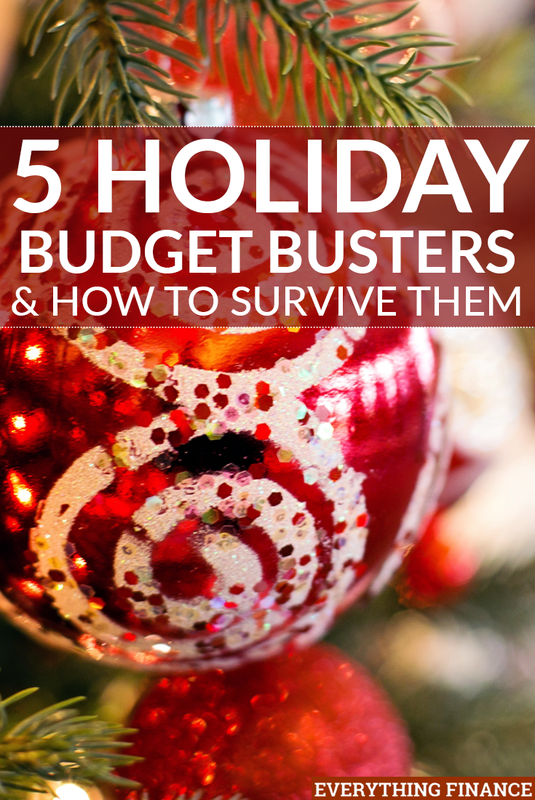 How do you avoid common holiday budget busters? Do you have a plan in place for any of the above?